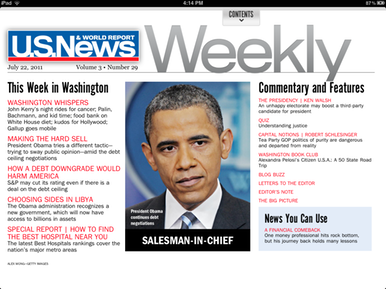 U.S. News & World Report unveiled U.S. News Weekly, its new iPad app, at midnight ET Thursday. The free app includes access to a single issue; subscriptions cost $1 per month. This marks the U.S. News & World Report’s first foray into the App Store, and the company has clearly spent time creating an immersive iPad magazine experience. You’re able to access the current issue, along with any past issues you’ve paid for. (You can continue to access old issues you received even if you let your subscription lapse.) The app adjusts its layout as you switch between portrait and landscape modes, and works equally well in both. Not everything’s flawless: Changing the font size, which you might assume would take effect instantly, actually requires a solid second or two as the content reflows across the screen. And you’ll get fairly accustomed to seeing U.S. News Weekly’s loading animation each time you tap the Next or Previous Story buttons. You can also tap to expose an issue’s table of contents from any page of the virtual magazine. Articles will sometimes include embedded video content, and the app supports AirPlay.